The profile fields – platform, OS and OS Version are now editable. The tags are also available using a custom selection box. Tags are only editable for MantisBT 1.2.9 or newer – not yet released. Rich text fields now use a lightweight WikiText-based renderer rather than the old HtmlText-one, which embedded a browser in the page. The new editor should provide better cross-platform stability and performance. 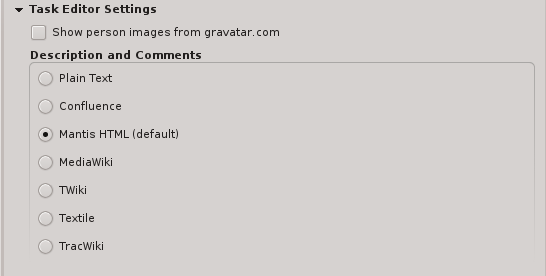 The rendered is enabled by default for new repositories. To enable it for existing repositories, open the repository properties page and in the ‘Task Editor Settings’ section select the Mantis HTML markup option. The connector support the upcoming MantisBT 1.2.9 version, which brings some small changes to the SOAP API. The custom date field values are now correctly translated from the repository value. Also, with MantisBT 1.2.9 the date and time information will be displayed in the user’s local timezone.